4 A Hot Black Hole? A black hole is a point in space with so much gravity that not even light (the fastest thing around) can escape, hence the name. To an observer it would just appear as a sphere of perfect blackness. At the heart of a black hole is an object called a singularity, a point of zero size and infinite density, yes you have read that correctly, Zero Size and Infinite Density. Any object can become a black hole but don’t worry; it would take a hell of a lot of work for something like your car to collapse space, unless of course your car weighed about the same as the sun. A Black Hole is an object for which nothing can get a high enough escape velocity to get away from it. Think of a cannonball being fired straight up in the air. As it goes up it will be slowed down by gravity and come crashing back down. If the speed is high enough however it will keep going until it escapes the gravitational pull. For the earth the escape velocity is 12km/s or 26,843mph, for something bigger like the sun the escape velocity is 618km/s or 1,382,430mph. Where is the mass of the planet or body, and is the radius you are taking off from. The formula contains no mass of the escaping object, if you wanted to get a space shuttle off the earth you would have to get it to the same speed as if you wanted to get a pebble off the earth, the difference being the amount of energy it would take getting something as heavy as a space shuttle up to the right speed. Cambridge scientist John Michell argued that if you made the value of M big enough in the escape velocity formula, then you could get a value for v that was bigger than the speed of light. We wouldn’t be able to see these objects as no light would be able to reach us, and, as nothing can travel faster than light, no objects would be able to escape their pull once they were close enough. This is a Black Hole. This is Newton’s Law of Gravitation. The value of the constant is 6.67428×10-11 which is quite small, however when you put in the mass of the sun and the earth and the distance between them the force that comes out is 3.76×1022N, which is equivalent a thousand million million (1 followed by 15 zeros) Saturn V rockets. When the force of gravity from a star becomes bigger than the outwards pressure caused by its temperature then the force starts to make the star collapse, pulling all its mass inwards to a central point. This point gets smaller and smaller and denser and denser as all of the stars mass is squashed into a tiny point. So for example if you wanted to turn the earth into a black hole you would have to compress it all down to about the size of a large mosquito, and if you wanted to turn your car into a black hole you would have to squash it down to the size of a neutrino, which is pretty small (about 1×10-24m wide). Once an object has been compressed to Schwarzschild radius it will continue to collapse until it becomes a singularity. Centred on this singularity will be a sphere of Schwarzschild radius called the Event Horizon. The Event Horizon is the last distance from which light can escape the pull of the black hole. Inside the event horizon, everything, including light, must move inward, getting crushed at the centre. 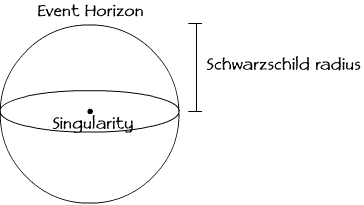 A diagram showing the arrangement of the singularity, event horizon and the Schwarzchild radius. The event horizon itself is not some physical barrier in space, it just represents the last distance at which it is possible to escape the gravitational pull. A person falling into a black hole through the event horizon wouldn’t notice anything different (although they may be preoccupied with the excruciating pain of being crushed and stretched by all that gravity). Due to the extreme nature of gravity around the event horizon some very weird things can happen. As I just stated, someone falling into a black hole wouldn’t notice any changes as he went through the event horizon, however, for someone watching at a safe distance it wouldn’t be that simple. Things moving away from a body get slowed down by the gravitational pull, the bigger the pull the more things get slowed down. Also the closer you are the more you are going to be slowed down. Both of these come from the fact that F∝M and F∝1/r2(from equation 2). As we sit at a safe distance and watch the unlucky person get closer and closer they seem to slow down! This can’t be right can it? Stuff moving away is meant to slow down; stuff moving towards the black hole should speed up! The way we see the person falling in is through photons (particles of light) being reflected off them and into our eye. As they get closer to the black hole the photons get slower and slower due to the increase of gravitational force, so they take longer to reach to reach the observer. The photons given off when the person crosses the even horizon will be slowed down to 0 by the gravity and so an observer will never see them disappear. Despite the fact that black holes just sit there in space sucking things in with their enormous gravity, it is possible for them to radiate, and thus have a temperature. 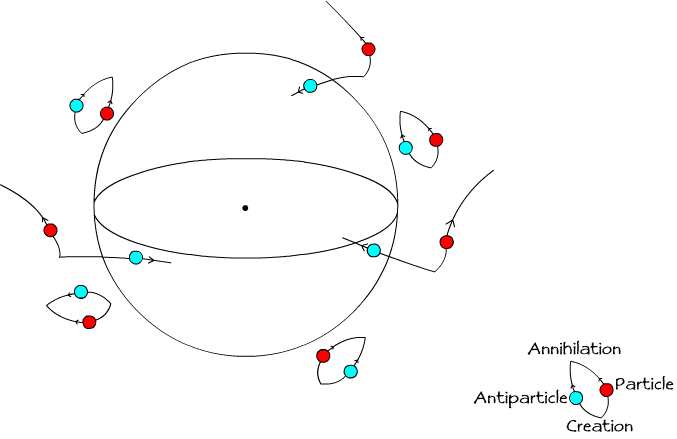 In the vacuum of space particle and antiparticles are continuously created and annihilated randomly. Usually these are just classed as virtual particles as they don’t really interact with anything and can’t usually be detected or measured. But if a virtual particle pair are created outside of the event horizon then it’s possible that one of them falls into the black hole before they can annihilate. The particle that is left can then fly off into space as a real particle. where we have the speed of light ( ), Plancks constant ( ), Gravitational Constant ( ), Boltzmanns constant ( ) and the mass of the black hole ( ). Notice that this equation contains both and , this indicates that black hole temperature is a ‘quantum-gravitational’ effect. where , , and are the usual constants and is the surface area of the event horizon. Like the temperature equation, the equation for entropy contains both Plancks constant and the Gravitational constant, showing that black hole entropy is a strictly ‘quantum-gravitational’ effect. As a black hole radiates via this virtual particle method it will loose mass and get smaller. Using Equation 4 we see that a smaller mass means a bigger temperature, so as the black hole radiates it gets smaller and hotter. If it gets hotter then the rate of radiation will increase and so you’ll have a chain reaction with the black hole getting ever smaller and hotter until it gets to zero mass. What happens then? Does the black hole just disappear with all the information that fell into it lost? A black hole of about 5 solar masses would have a temperature of about 12×10-9 Kelvin. The temperature of space is about 2.7K which is quite a lot bigger. So the temperature of space would be providing loads of energy to the black hole via the Second Law of Thermodynamics. This heat energy will add to the mass of the black hole (via E=mc2) which will make the black hole bigger and colder. In order to ‘see’ an evaporation you would need the black hole to have a temperature above the temperature of space, which equates to starting off as a mass thats lighter than the moon. If you had managed to squash your car down to a black hole (squashing it to 1×10-24m wide) then it would evaporate in about 1×10-9 seconds. This may seem like an odd title, and it is, but trust me when I say that it is a perfectly acceptable phrase in physics. It refers to the fact that all you need to perfectly describe any black hole is 3 externally observable numbers, the rest of the information (hair) about the matter that made the black hole is lost. The 3 numbers you need to describe a black hole are its Mass ( ), Angular Momentum ( ) and Charge ( ). All other information is lost, which is potentially a huge amount, as a black hole with a given , and can be formed from many different collections of particles. So if you had two stars with the same values for , , and , but one was made of matter and the other antimatter, then when they collapsed to black holes they would be identical. You wouldn’t be able to tell which was which. Information is lost behind the event horizon. The main equations we have so far for a black hole are 3, 4 and 5. As you can see, the only variable in equations 3 and 4 is mass ( ). Equation 5 only depends on the surface are of the event horizon , however the surface area of a sphere depends on its radius, and from equation 3 we know that radius depends on .